Flowers Forever at O’Leaversfest, Sept. 23, 2016. Another O’Leaversfest has come and gone. Alas, I was only able to take part in Day 1, last Friday night, and only for the closing band. If the rest of the weekend was as well attended as Day 1, organizers may want to consider adding a camping option for the festival — let all those out-of-towners pitch their tents in the volleyball courts. Flowers Forever drew everyone back inside. In the old days, Flowers Forever was Derek Pressnall and whoever joined him on stage (but with a couple regulars). Friday was the same thing, with original member Craig Dee on drums. Third original member. Chris Senseney, was not in the house (or at least I didn’t see him). 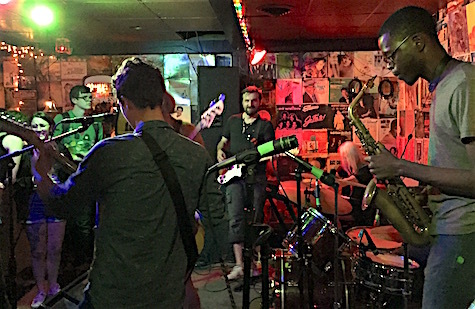 The other five slots were filled with a few familiar faces, including Annie Dilocker on keyboards and Sarah Bohling of Icky Blossoms on bass. The set kicked off with an rousing version of “American Dream” off the 2008 debut (and as far as I know, the only Flowers Forever album released) and barrelled through a number of other songs off the album including “Black Pope” and “Strange Fruit.” I’d forgotten how much I liked the record when it came out. To me it always felt like an outsider coming into the cloistered Nebraska scene and creating his own, new thing from the bits and pieces that resonated with him. The outsider being Pressnall, the bits and pieces being the more upbeat moments from Bright Eyes’ early 2000s offerings. Of the unknown players on stage, a standout was the lead guitarist, a young guy who absolutely shredded throughout the set. The next day Craig Dee told me the guy was Cubby Phillips, who, upon further research, I discovered is a jazz dude who won the Outstanding Soloist Award at the 2013 Great Planes Jazz Festival. Head-spinning skills, he has. (Update: Dereck Higgins just pointed out that he’s the guitarist in Chemicals). Jackie Greene plays at Slowdown Jr. Tuesday, Sept. 27. 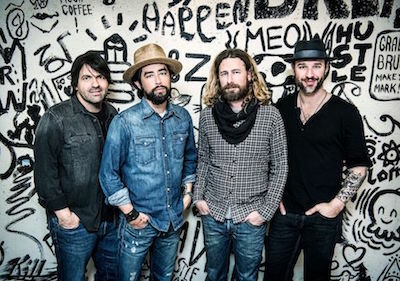 Roots / American singer-songwriter Jackie Greene is known as a musician’s musician, having played with a ton of people over the years, including as a member of the last iteration of Black Crowes and with Joan Osborne in Trigger Hippy. His latest album, Back to Birth (2015, Yep Roc), was produced by Los Lobos member Steve Berlin, and will appeal to Black Crowes fans or anyone who enjoys dense, guitar-infused American Trad rock. Osaka, Japan. A distant second would be Perth. Somewhere in rural South Dakota. It was winter and the gear froze. Someday, I’d like to open my own typewriter repair shop. We’d only service post-war American-made machines. We’d have limited hours. I probably wouldn’t like to do anything involving a nail salon. I have a friend from Omaha. I’ve heard lots of stories. Most of them good. It’s a night of emo rock at Milk Run this evening. Headlining is Omaha’s own Super Ghost, whereas the traveling band is Minnesota act Weathered. Altura and Medlock open. 9 p.m. $5. Jacob “Cubby” Philips is the guitarist in Chemicals.